Firebrand deejay Teflon, widely regarded as one of the most exciting new talents to emerge out of dancehall in the past two years, is getting a lot of requests for shows this Christmas season. "As more and more people realize that he is here in Jamaica and available, the requests are flooding in. People are looking to Teflon as one of the artistes who will take reggae to higher heights internationally, especially in Europe where he has a loyal and still growing fan base," Tamoyo Campbell, a member of Teflon's management team, said. 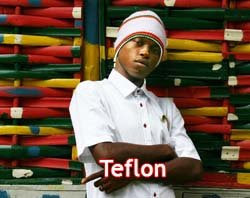 Teflon performed at the Reggae Fever show in Montego Bay over the weekend. He will also be performing at Sugar Minott's Reggae in the Hills on December 25. He has a show in Portland on Dec. 27 and he has a pair of shows on New Year's Day, one is the Anthony B Family Funday and another show in St Elizabeth. In the meantime, the deejay is pushing ahead with the promotion of his new single Jailhouse Rock which is already a inside sensation in the dancehall community. "The video for Jailhouse Rock is now ready, and it looks great, people are going to be amazed as we got some great shots. However, we have decided to hold off until the new year to release the video until after the busy Christmas season," Teflon told one876 this week. "The entire community came out on the day of the video shoot including the area leader to support Teflon. The shoot ran from in the morning to 11 pm. This is some of my best work and I know that people will love what we have been able to do with this video," director Wayne South told one876.